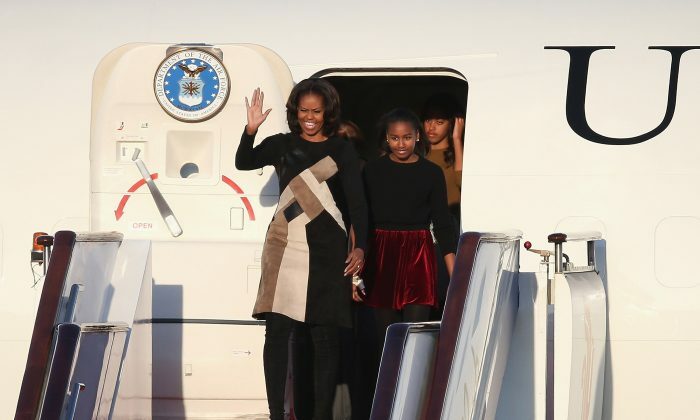 First lady Michelle Obama arrived with her mother and two daughters in Beijing March 19, beginning a carefully scheduled, one-week “people-to-people exchange” between the United States and China. For the first lady, whose host is Peng Liyuan, wife of Communist Party General Secretary Xi Jinping, the focus of the trip is education, not politics, according to the White House. Aides of Mrs. Obama say the visit is intended to contrast with official talks at the presidential level. Highlighting the need for understanding between American and Chinese youth, the first lady will promote educational exchange programs. Chinese make up the largest proportion of foreign students in the United States, their numbers standing at around 200,000. By contrast, only 20,000 Americans are currently studying in China, a figure Washington wants to raise. “Her focus on people-to-people relations, her focus on education and youth empowerment is one that we believe will resonate in China,” said Benjamin J. Rhodes, the deputy national security adviser, in a briefing with reporters. “If young Americans are able to understand China, able, through our educational exchanges, to study in China, that will be invaluable experience for one of the principal actors in the global economy,” he added. Mrs. Obama’s Chinese-American chief of staff Tina Tchen said the multigenerational visit would appeal to the Chinese sense of tradition. At the same time, with Washington and Beijing clashing on disagreements involving topics like trade, cyberespionage, territorial claims, and human rights, and in light of the upcoming nuclear summit meeting between President Obama and General Secretary Xi, avoiding politics altogether will be a challenge, or a mistake. “While the intentions here may be good, this is a terrible misreading of China, of international politics and of America’s vital place in the world,” wrote Claudia Rosett, with the Foundation for the Defense of Democracies, a think tank in Washington, D.C. “China is one of the world’s worst violators of human rights, and its government holds sway over more than 1.3 billion people — more than one-sixth of humanity,” Rosett said. Mrs. Obama’s avoidance of issues like censorship, enforced disappearances, torture, coerced confessions, and ethnic discrimination will likely show China that “America is a shrinking power — less and less willing to stand up for its own values,” Rosett argues. Perhaps America can expect, at the least, that Mrs. Obama’s smiles will endear Chinese people somewhat more to the United States. Though Mrs. Obama’s emphasis on the benign topic of education is typical for First Ladies, wives of previous presidents, 14 of which have been to China, have at times been outspoken on sensitive issues. In 2008, when President Bush attended the Beijing Olympics, First Lady Laura Bush visited a refugee camp near the Thai and Burmese borders to call attention to Burmese displaced by their country’s China-backed authoritarian government. And in 1995, at a conference in Beijing, Hillary Clinton spoke out against the mistreatment of women in China. Perhaps, however, Mrs. Obama’s trip will not go without any reference to sensitive issues. One item included on the itinerary is a meal at a Tibetan restaurant in Chengdu, the capital of southern China’s Sichuan Province on March 26. With research by Lu Chen.